Due to the high volume of visitors to the markets, The Finders Keepers highly recommends using public transport. 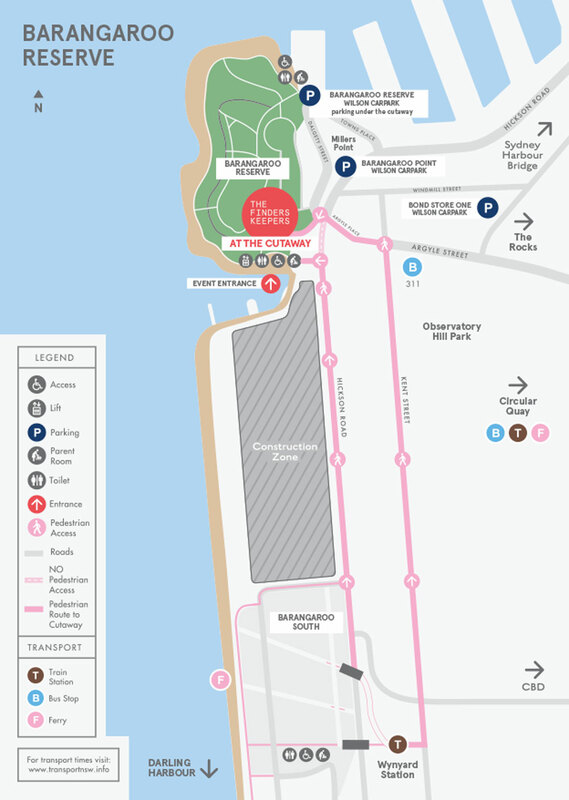 The Barangaroo website has comprehensive information about getting to and from Barangaroo Reserve via bus, train, ferry, cycling, walking, car, taxi and water taxis. The Cutaway, Barangaroo Reserve is only a short walk from both Wynyard and Circular Quay stations. Walking directions from both Wynyard and Circular Quay can be found here. IMPORTANT NOTE: Please see map below for pedestrian access and walk ways. There is a no stopping zone on Hickson Road due to these new changes, so you need to follow the map below, and signage as indicated. Please note: Upgrades to Hickson Road may effect access to the venue. Please visit the Barangaroo Community Notice Board here for the latest updates. For more detailed instructions on how to get to Barangaroo Reserve, see here. Limited parking is available. Wilson Parking operates a public car park at Barangaroo Reserve providing a limit of 300 car spaces over two basement levels. The car park operates between 6am - midnight, 7 days per week. The car park has 8 accessible parking spaces on Level B1. For current fees, charges and maps head to the Wilson Parking Barangaroo Reserve Car Park website. The Cutaway is a fully accessible venue. All areas of the building utilised by the markets are fully accessible to less mobile persons, including toilet facilities. The Cutaway is wheelchair accessible and houses the lift and amenities, including accessible toilets. It is recommended that guests attending events in The Cutaway requiring additional sensory considerations please call 1300 966 480 or email info@barangaroo.com for more information. For more information please check the Barangaroo’s website.